My one year old child will not drink milk, she will only drink or eat yoghurt. My 10 year old daughter wont eat sandwiches for school but will eat yoghurt. The convenience of the yoghurt pouch rather than the tub means that I don’t have to spoon feed the baby and the 10 year old doesn’t lose all of my spoons at school. However, this has become quiet an expensive habit, since 2 children X 7 days a week at $1 per pouch totals $14 per week. To resolve this I started to make my own yoghurt. I am able to make 1L of yoghurt for a cost of approximately $1. All it requires is 1L of milk, and a small amount of yoghurt and milk powder. I use a thermomix but it can be done on the stove top using a thermometer or in a thermochef. I have come to realise that if you make this without sugar it is ‘natural yoghurt’ but if you add sugar it becomes ‘Greek yoghurt’. Heat 1L of UHD full cream milk (long life milk) in a pan on low until it reaches 37degrees ( thermomix: heat for 5mins, at 37degrees, on speed 3). If you use skim milk it will make a runny yoghurt. If you use fresh milk, you will have to heat it to 80degrees first to kill the bad bacteria and then let it cool to 37 degrees before you proceed with step 2. Add 60g of yoghurt either saved from your last batch or if you are just starting off, Jalna or the Aldi sweet and natural Greek yoghurt is good to use. Add 60g sugar or more or less depending on how sweet you want your yoghurt. If you don’t add any sugar it will be tart like natural yoghurt. Meanwhile pour a small amount of boiling water into an insulated or thermo container (or thermoserver) to warm it up. You will need to empty the water and dry the container just before doing step 7. You’re basically needing something that will keep your yoghurt warm like a thermos. Or use an Easyyo yoghurt maker- you can buy one second hand for as little as $10. Pour the yoghurt into the thermos container with a lid and let it sit undisturbed for 8-10 hours. A nice warm place is best. I heat my oven for 5 mins until it is slightly warm like the inside of a car, then turn it off and put my thermo container inside (with a note on the door saying “do not turn on… yoghurt is brewing inside!!”). Obviously make sure the element and shelves are not too hot or you will melt your container. Alternatively you can wrap the container in a towel to keep warm on a bench but my yoghurt would not thicken enough this way. If you make your yoghurt after dinner your oven is likely already slightly warm and you can let your yoghurt brew overnight. Or if you are a little worried about doing this in the oven, check out this Euro Cuisine Yoghurt maker. But I still needed to replicate the pouch. I found some ready made pouches online at Amazon and they still work out cheaper than buying the yoghurt ‘pre-pouched’. You can purchase re-usable pouches on Amazon for $1.50- to $2 each or you can purchase 50 single use pouches for $11 (works out to be 20 cents per pouch). For those who want to be super frugal, I found that a sippy cup with a straw will do the job just as well. If the yoghurt is too thick, water it down a little with milk so that it can be sucked through the straw easier. 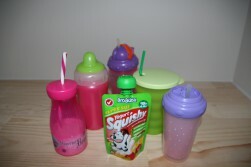 If you freeze some of your yoghurt in ice cubes you can throw a couple of them in the sippy cup to keep them icy cold. Make your yoghurt at home for half the price of the store bought stuff. And this was the ‘AFTER’. These frames were purchased from Big w for $15 each and the photos were $10 each to enlarge from a regular sized photo.